Thanksgiving is literally next week. 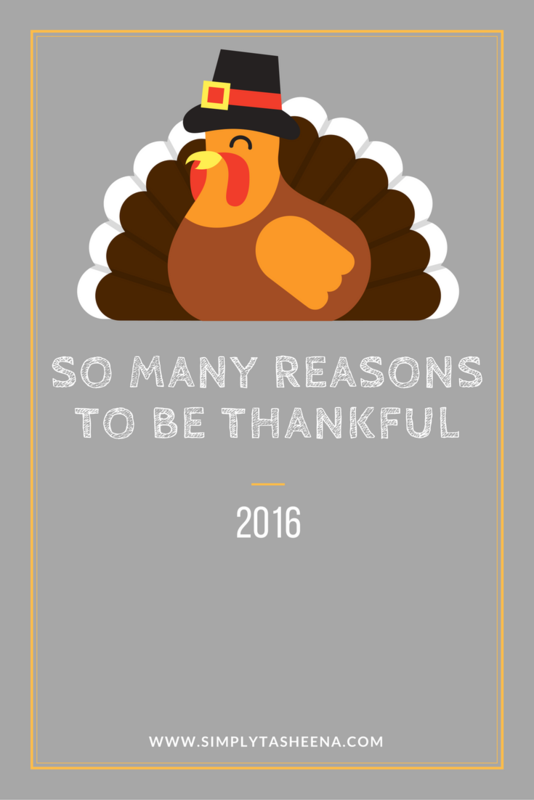 In 2012 and 2014 I shared what I was Thankful for on the Blog here and here and I thought it was time to take a moment to share what I'm Thankful for this year... This year was an age milestone year for me and I honestly had mixed feelings (like most women getting older). In 2015, I sat back and asked myself “where did time go? ” I have a 12 (now 13) a spouse that I feel like we've been together for forever. Seriously where does time go? I've learned that time waits for no one and 2016 really proved that for me in many ways. I am simply Thankful for everything. Family, friends that have turned into family, a spouse that supports all of my crazy ideas, The Blogger Community who I had no idea existed until I became a Blogger and love. I've also learned so much about becoming a better blogger too this year, and Google. Yes, Google!! I remember if I would have to visit a library to learn something new by reading a book. Now we have knowledge at the touch of our fingertips. I'm also Thankful for the people that believe in me at times when I don't even believe in myself. Thank you! Glad to hear that. For me, even though it has been a tough year personally and professionally, surprisingly the 'blogger world' gave me a lot to cheer about in terms of friendship and recognition. And that really helped me sail through some tough times.